I would say Gundam is more akin to Star Trek than Star Wars. Both series are more science fiction as opposed to science fantasy. Both deal with topical issues like war, discrimination, evolution, and politics. And both series were cancelled during their original run. However, aside from laser swords and a group of people with special powers, one thing the Gundam series does have in common with Star Wars is a fascination with how things got to be the way they are. For fans of Star Wars, there was the prequel trilogy. For fans of Gundam, there have been tons of books, manga, documents, and now, Mobile Suit Gundam The Origin: a 4-part OVA series depicting the time from the death of the political leader, Zeon Zum Deikun to the One Year War and following closely the footsteps of one of Japan's most iconic characters, Char Aznable. Part one, Blue-Eyed Casval was recently released in limited theaters in Japan on Blu-ray and online through various streaming services (Oddly enough, the DVD version will be released next month). Blue-Eyed Casval traces the steps of Casval Rem Deikun, son of Zeon, after his father's assassination to Casval's escape to Earth, and focuses on the various people who shaped him into the man he eventually becomes. So, how does the Gundam prequel stand now that I've gotten you all worried with the Star Wars prequel reference? Surprise! It's actually pretty good. Fans of the original Gundam series are in for a treat, as they get to see many of the iconic characters from the original series in their younger forms. A few are already fully developed from the start, but others are mere blocks that you get to see chiseled into the characters you recognize – in the case of Dozle Zabi, quite literally in fact. Each character plays a role and the anime explores who they are quite well. Perhaps most interesting are the female characters of Kycillia Zabi and Crowley Hamon. Both are portrayed as complex characters, with Kycillia, a headstrong, assertive and power-hungry warrior, often in conflict with her older brothers who outrank her chiefly only because they are men and older than her, and Crowley, an able, streetsmart, and cunning woman, with a strong sense of survival and a fierce sense of loyalty. All the major characters of Gundam have had extensive side stories written about them, and Gundam The Origin is a welcome addition to the lore. There is some serious Shakespearian drama going on in the story with assassinations, power struggles, imprisonment in towers, conspiracy, and political turmoil. This is the story about the lead up to the war between the Earth Federation and the space colonies, so there is a lot of scheming and danger about, and it's all pretty captivating. Caught up in it all, the main characters, Casval and his sister, Artesia, find themselves as both targets, and pawns in the plot to unite the space colonies and spark conflict with the Earth Federation. In the midst of it all, Casval quickly comes to realize the potential power he has as the son of Zeon, and the danger that puts him in. The real meat of Blue-Eyed Casval is watching the planting of the seeds that will later on grow to make the man Char Aznable. Not that all of the plot is flawless. As someone who grew up with the Gundam series and is intimately familiar with it, I got the feeling here and there that the story seemed to be written to enforce who the characters would become, rather than who they are. 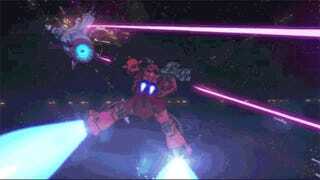 For example, at a pivotal point in the story, Casval takes control of a mech and destroys 4 or 5 enemy mechs. For me, this felt a little contrived. It was like the anime was trying to show how even at the age of 11, Casval was a natural, when it didn't need to. One other big problem I had was that, for a mecha anime, there were very few mecha. I wanted more mecha. I know that it's nitpicking, seeing as mecha – or Mobile Suits as they're called in the Gundam universe – didn't become common weapons until years later in the story. Still if that's the case, I would rather there were no mecha, than some mecha. And aside from the flashback (flash forward?) sequences, what mecha there were, seemed crowbarred in. It also didn't help that what mecha action there was, was animated in CG, which in my opinion, hits the uncanny valley effect square on the head and really kills the immersion. One major point I should make – which really doesn't help that it's this far down in the article – is that this anime is totally not for beginners. People will need extensive knowledge of who Char Aznable is before they can venture into this story of who he was. Not only Char, but the supporting characters as well. This is definitely not a case where it's possible to watch the prequel first. Mobile Suit Gundam The Origin: Blue-Eyed Casval is a Gundam anime for Gundam fans. If you love the Universal Century Gundam universe, while this new expansion isn't necessarily a game-changer, it does comfortably add to the Universal Century timeline and is well worth seeing.